Red and the Peanut: Happy St. Valentine's Day! Have a happy St. Valentine's Day all you beautiful bird lovers! 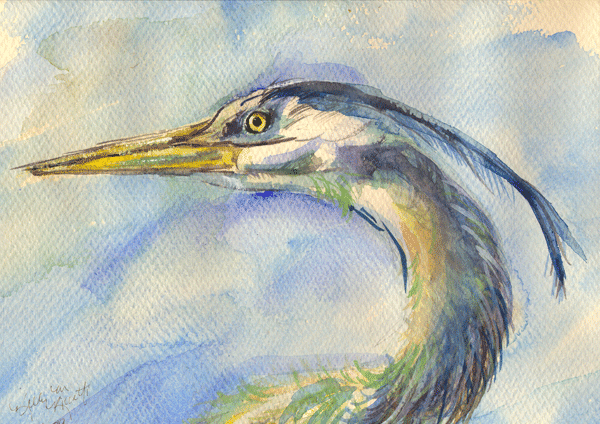 ...these are paintings 112 and 113 in the 100 Paintings Challenge. The idea came to me while I was taking Laure Ferlita's mini eClass: Valentine Cards. Our assignment was painting roses, and after I finished my class roses, "Chiggy Tugging on a Rose Petal" popped into my head. I love the simplicity of the first little chickadee. I hope you all have a wonderful St. Valentine's Day. Now that is one sweet little bird! Very nicely done. I sat for a few hours hoping to get a good shot on these nervous little birds and got 4.I did see the first purple finches coming through. They stay for 2-3 weeks until it warms enough to fly farther north. Gorgeous, Kelly. Light, simple, sweet! Such a sweet little chickadee! Happy Valentine's Day! You made a lovely Valentine, Kelly...Chiggy is a sweet heart! Adorable, clever, and beautifully done, as always! Very charming. Nice work, Kelly. Love it. Can I give those to my wife?! Wonderful! Especially like the first picture. Happy Valentine's Day back. So clever and so perfect for Valentine's Day. We'll be back in Ohio soon and hope the snow is gone by then. Hi Kelly ...that is so precious very nice ♥ ♥ &hearts:Happy Valentines to you to!!! Such a charming idea for a picture and so well executed. Nice shots of the hawk in the previous post too. Happy Valentine's Day. The second painting would make a perfect Valentine card. Sue...thank you! Chiggies take the cake for sweet! Steve...alright! I'll head over to see the Chiggy shots. Glad to hear the Purple Finches are coming through. I guess spring can't be far behind. Chris...thank you! With Rick and Matty around, it's bound to be fun! Vickie...thank you! I want to do more of the light...simple...sweet. I like that, but I always tend to go to the detail! Eileen...thank you. Chiggies make it easy! Thanks, Wanda! It's so fun playing around with chickadees...they are so distinctive, you can capture them with just a few paint strokes! Cicero....the first is my favorite too. I love his little tugging posture. thank you! Thanks, Grammie...it was definitely fun painting them, and they only took a few minutes...no detail and quick. Oh this is FABULOUS! And a great idea!! Looking at your post this wintry morning, Kelly, cheered me up. I think I am going to forward the picture to me husband and tell him it's from me! :-) Of course, he won't believe it - He knows I don't have your gift. Wonderful post!! Happy Valentine's day! 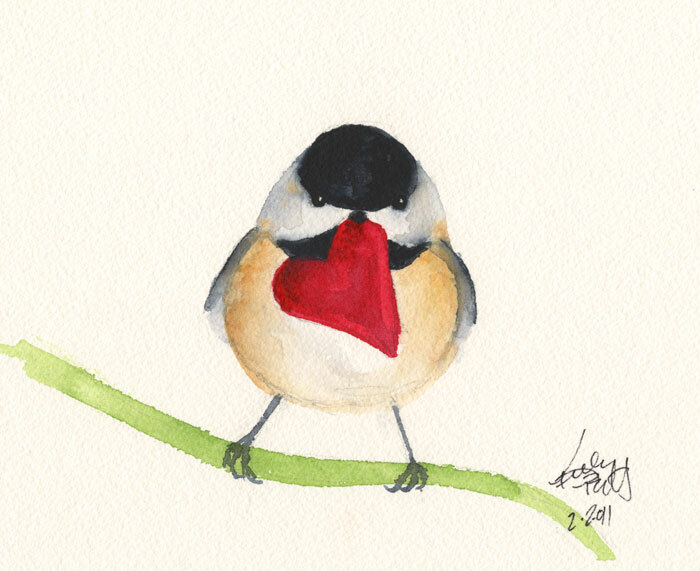 Sweet Chickadee and Happy Valentines. That young Coopers is fantastic. 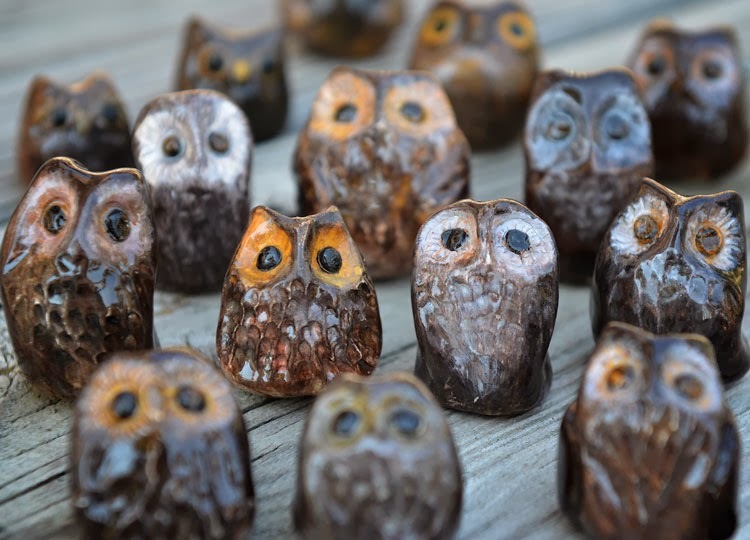 Now how do you get them to fly up on your deck and pose? Awww..I LOVE this! You are amazing! Thanks! What a cute idea, and so well done! A chickadee with an offer no one can refuse! Happy Valentine's Day! Lovely! 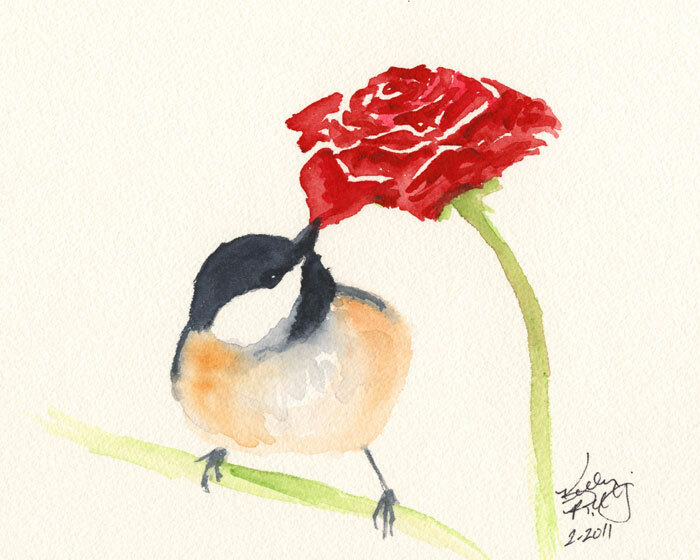 The chickadee and the roses are perfect for Valentine's Day. Happy Valentine's Day to you. Happy Valentine's Day, Kelly! Hope it was as sweet as your little painting! Trout....that was the first time a Cooper's sat on the deck. Boy...what a surprise! 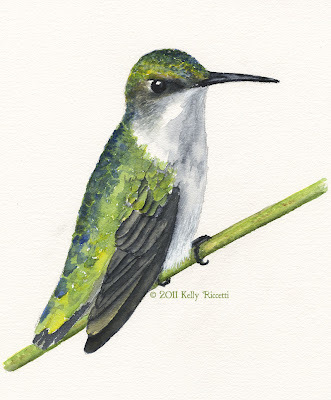 I'm glad he didn't fly far, because I was able to really study him. Thanks!! Grizz...thanks! Wouldn't it be cute if a chickadee really did pluck off a petal and carried it around. I can see it in my mind's eye!! Elaine...thank you! Hope you had a nice one! Laure....thank you! I loved your class...it was a sweet day. Hope your day was too! What a perfect Valentine! Thanks! It is so sweet! Wonderful paintings. Hope you had a good day.